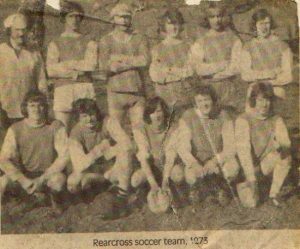 Rearcross Football Club became an affiliate of the Football Association of Ireland in August 1983, when the Club entered a team in the North Tipperary and District League, however the origins of soccer in Rearcross go back to 1966, the following ‘trip down memory lane’ was compiled by Johnny Gleeson who was one of the founder members of Rearcross F.C. Back Row (L to R): Liam Armshaw, Billy Berkery, Patsy O’Brien, Martin Armshaw, Johnny Ryan, Pius Armshaw(RIP) Front Row: (L to R): P.J. Caplis, Jerry O’Toole, Johnny Duggan(RIP), Gerry Quigley, Johnny Barrett.